Westhaven Drills 12.90 Meters of 12.11 g/t Gold & Prepares To Resume Drilling At Shovelnose | Energy and Gold Ltd.
Westhaven Ventures (TSX-V:WHN, OTC: WTHVF) updated investors this morning with complete results from its recently completed drilling program at its Shovelnose Project in southern British Columbia, Canada. Westhaven hit high-grade gold mineralization in 3 out of 5 of its recently completed holes (SN18-18, SN18-21, and SN18-22) in addition to a shallow high grade intercept in hole SN18-16 (Westhaven also reported assays from holes SN18-16 and SN18-17 from the previous program which ended in September). The headline intercept was in hole SN18-21 which returned 12.90 meters of 12.11 g/t gold and 94.31 g/t silver (roughly 13.5 g/t Au-Eq), including 1.40 meters of 92.80 g/t gold and 641.54 g/t silver – Hole SN18-22 also returned 5.35 meters of 8.79 g/t gold and 32.34 g/t silver. Hole SN18-16 which was drill collared 50 meters to the north of SN18-12 returned 2.38 meters of 16.80 g/t gold (Au) and 40.90 g/t silver (Ag) which is quite promising because it indicates the high grade mineralization extends farther to the north than was previously known. All in all the market has decided to sell on the news of today’s results primarily because Westhaven did not produce an SN18-14 (24.5 meters of 17.77 g/t gold and 107.9 g/t silver) or SN18-15 (46.20 meters of 8.95 g/t gold and 65.47 g/t silver) type of intercept. 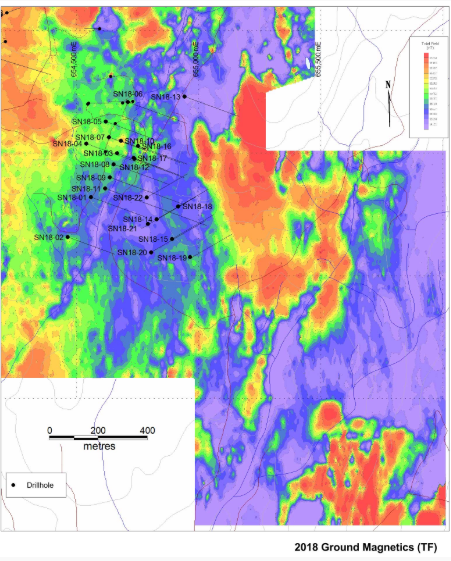 However, this morning’s results are highly encouraging because they confirm that there is a second vein zone which contains high grade gold mineralization and Westhaven hasn’t even targeted the “sweet spot” of this second vein zone yet. Westhaven has also gained a great deal of information from their recent drilling including that the preferred elevation, where the high grade mineralization exists, is right around 1200 meters. This knowledge will be used to target the next phase of drilling which will begin in early February and consist of at least 7 holes and at least 2,500 meters of drilling. 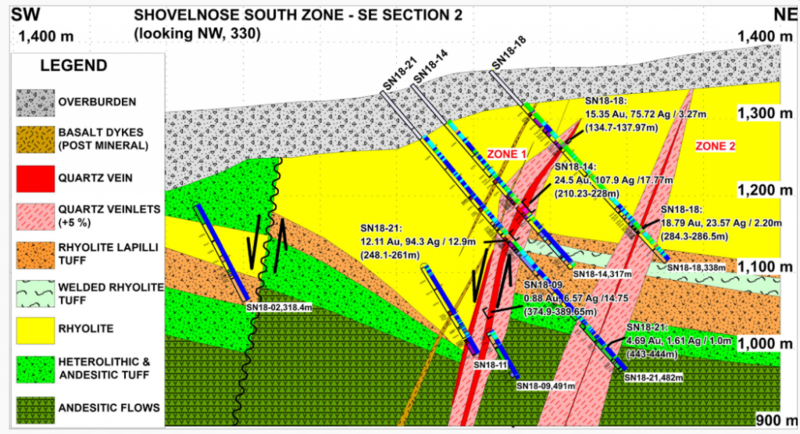 Westhaven VP of exploration Peter Fischl believes there are multiple vein zones at the South Zone and Westhaven hasn’t even drilled this new second vein at the preferred elevation, where the “sweet spot” (highest grade mineralization) might be. As it stands now the first hole in February will be an uppercut to hole SN18-18 and Westhaven will let the drill run in order to target the sweet spot in the second vein zone, and to potentially find new vein zones. Westhaven has more than C$1 million cash in the treasury and the company is expecting a tax refund from the Canadian government totaling C$600,000 by the end of February. The company has no current financing needs due to its low corporate overhead and low all-in cost of drilling at Shovelnose (C$175 per meter all-in). I am as bullish as ever on the Westhaven story (I added to my already large position this morning at $.93 and $.88) and I have a feeling that this morning’s weakness might be short lived as investors begin to turn their attention to the next phase of drilling at Shovelnose and the potential that also exists at Westhaven’s other properties (Skoonka, Skoonka North, and Prospect Valley). It is still early days in the Spences Bridge Gold Belt and 2019 is shaping up to be the most active year of exploration in the history of this gold belt. Disclosure: Author owns shares of Westhaven Ventures at the time of publishing this article and may buy or sell at any time without notice.